Chinh Do – Chinh’s not quite random thoughts on software development, .NET, gadgets, and other things. Chinh’s not quite random thoughts on software development, .NET, gadgets, and other things. The original version is Cuentame (The Speak Up Mambo) by The Manhattan Transfer. I had a hard time finding the original song myself. I hate that most “foreign” songs translated to Vietnamese simply have this in the credit line: “Nhạc Ngoại” (foreign song). If you are going to translate/record the song in Vietnamese, at least give proper credit to the original performer/composer. Hãy vui đêm nay, nét môi thơm nồng ái ân ! Hát lên muôn ngàn câu hát ngất ngây tình yêu đắm say ! u u u u u …. Verizon Wireless is running a promo until 1/6/2016, that will give you 2 GB of free data for life if you are on an XL plan or larger, and you upgrade an existing device or add a new device. Here’s how to you can take advantage of this promo and add the 2 GB of bonus data per line for life by spending about $50, even if you don’t have an upgrade available. To me, $40 for 2 GB of data per month for life is more than worth it. “Upgrade” your device to the cheapest smartphone available. Right now for me it would be the Droid Mini. The full price is $108. If you are ordering online, make sure the confirmation page says you are getting 2 GB data bonus. If via a Verizon rep, confirm with her/him. Activate the new Droid Mini. Wait a day or two, and reactive your original phone, and sell the Droid Mini on eBay or the marketplace of your choice. You should get about $90 for it. Total cost to you, excluding shipping, etc is about $40. Disclaimer: while I believe this to work based on my own experience and available information. I cannot warranty that this will work for you. 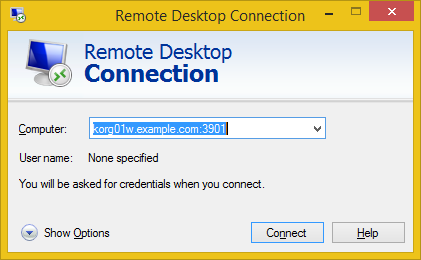 If you have more than one servers/PCs running at home behind the internet router, you can normally set up the router port forwarding to forward Remote Desktop traffic to just one server. However, by assigning different incoming ports for different servers, you can connect to each server individually. Basically, use a different port for each server. 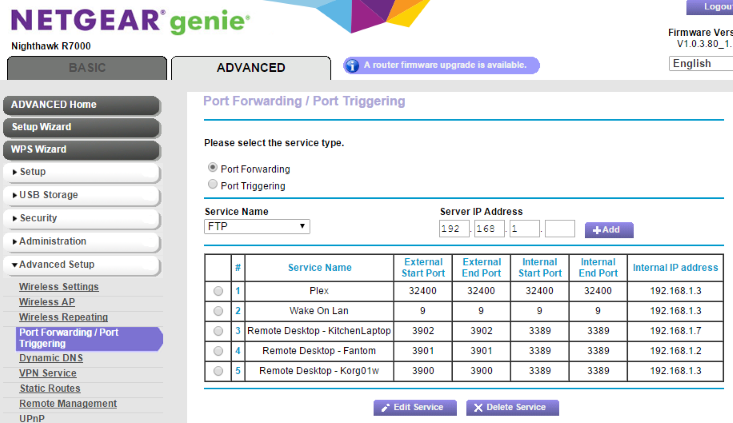 Then configure the port forwarding on the router to router each port to the appropriate server on 3389. This assumes that your router supports different ranges for external and internal ports. By using non-standard ports, there’s also a side benefit of a little extra security. Under Network Properties, Power Management, check “Allow this device to wake the computer” and “Only allow a magic packet to wake the computer”. Under Advanced tab, make sure “Wake on Magic Packet” and “Wake on pattern match” are enabled. On the Internet router, forward port 9 to the server. Use “Wol Wake on Lan” Android app to wake up server. Delete/backup all the files in %WINDIR%\System32\Winevt\Logs then try starting the service again. Write-Output "Submitting feed to $gsaUrl." Write-Output "Posting feed to GSA:"
$r=Invoke-WebRequest -uri $gsaUrl -method POST -body $body -ContentType $contentType -UserAgent "Ps-GsaFeedSubmitter"
If there are less than 7 days left in the month, then it’s the last weekday of this type in this month. Putting up an old article I published on .NET Slackers. In a typical multi-tier application, one of the biggest performance bottlenecks is the overhead of making round-trips to the database. Minimizing these round-trips is often the first area you should look at during performance tuning. Fortunately, the Oracle Data Provider for .NET (ODP.NET) makes it fairly easy to do this by providing several built-in methods to write and read data in bulk. ODP.NET 2.0 (download from here). "insert into bulk_test (employee_id, first_name, last_name, dob) "
As you can see, the code does not look that much different from doing a regular single-record insert. However, the performance improvement is quite drastic, depending on the number of records involved. The more records you have to insert, the bigger the performance gain. On my development PC, inserting 1,000 records using Array Binding is 90 times faster than inserting the records one at a time. Yes, you read that right: 90 times faster! Your results will vary, depending on the record size and network speed/bandwidth to the database server. A bit of investigative work reveals that the SQL is considered to be “executed” multiple times on the server side. The evidence comes from V$SQL (look at the EXECUTIONS column). However, from the .NET point of view, everything was done in one call. PL/SQL Associative Arrays (formerly PL/SQL Index-By Tables) allow .NET code to pass arrays as parameters to PL/SQL code (stored procedure or anonymous PL/SQL blocks). Once the arrays are in PL/SQL, you are free to use them in whichever way you wish, including turning around and inserting them into a table using the “forall” bulk bind syntax. You need to perform additional work in PL/SQL, in addition to the bulk insert. The application login does not have permission to perform the work, but you can grant the necessary privilege to a stored procedure. The major drawback with using Associative Arrays is that you have to write PL/SQL code. I have nothing against PL/SQL, but it’s not part of the skill set of the typical .NET developer. To most .NET developers, PL/SQL will be harder to write and maintain, so you will have to weigh this drawback against the potential gain in performance. string sql = "declare "
+ "type t_emp_id is table of bulk_test.employee_id%type index by pls_integer; "
+ "type t_first_name is table of bulk_test.first_name%type index by pls_integer; "
+ "type t_last_name is table of bulk_test.last_name%type index by pls_integer; "
+ "type t_dob is table of bulk_test.dob%type index by pls_integer; "
+ "  p_emp_id := :emp_id; "
+ "  p_first_name := :first_name; "
+ "  p_last_name := :last_name; "
+ "  p_dob := :dob; "
+ "  forall i in p_emp_id.first..p_emp_id.last "
+ "    insert into bulk_test (employee_id, first_name, last_name, dob) "
+ "    values (p_emp_id(i), p_first_name(i) , p_last_name(i), p_dob(i)); "
+ "  open :c1 for "
+ "  select employee_id, first_name, last_name, dob from bulk_test;"
ODP.NET Ref Cursors are objects that point to Oracle server-side cursors (or result sets). The important thing to .NET developers is that a Ref Cursor can be converted to the familiar OracleDataReader. With Ref Cursors, the logic to open result sets can be written entirely in PL/SQL and the results returned to .NET via Ref Cursors. You need to perform additional work in PL/SQL before returning the result set(s). The user does not have direct access to the table(s) in question. Here is a real world example. Say you need to update a record in the Orders table and insert a new record into the OrdersAudit table at the same time. Instead of executing two database calls, you can wrap everything into an anonymous PL/SQL block and make one database call. See the previous section for code example using a Ref Cursor. Controlling the FetchSize property is another method to minimize server round-trips. When you read data from the server using the OracleDataReader object, ODP.NET retrieves the data for you in chunks behind the scene. By default, a 64K chunk of data is retrieved each time. However, you can change the chunk size by setting the FetchSize property. By increasing FetchSize, you will lower the number of data retrieval round-trips and increase the overall retrieval operation. On my development PC, when reading 10,000 records from BULK_TEST, setting FetchSize = RowSize * improves the total elapsed time by a factor of two over leaving FetchSize at the default value (985 vs. 407 milliseconds). For clarity purposes, the example code in this article does not use the “using” pattern for IDisposable objects. It’s recommended that you always use “using” with IDisposable objects such as OracleConnection or OracleCommand. In this article, we looked at how various bulk operations in ODP.NET 2.0 can help you improve the performance of your ODP.NET application. Being familiar with these techniques can help you plan, design and implement applications that meet performance goals. I had to spend quite a bit of time figuring this out. So hopefully this will help someone out there. To launch MSDEPLOY from PowerShell, make sure you escape any quote or comma characters. If you still have problems, download and use EchoArgs.exe to see exactly what PowerShell sees. throw "MSDEPLOY.EXE is not installed. See http://go.microsoft.com/?linkid=9278654"
If you are getting error 1053 starting “Web Deployment Agent Service” (part of Microsoft Web Deploy or MSDEPLOY), below is a possible fix. A timeout was reached (30000 milliseconds) while waiting for the Web Deployment Agent Service service to connect. The fix for me was to uninstall any previous version of Web Deploy, then re-install the latest version (Microsoft Web Deploy 3.5), and choosing “Complete” at the “Choose Setup Type” page. My environment: Windows Server 2008 64-bit SP2.